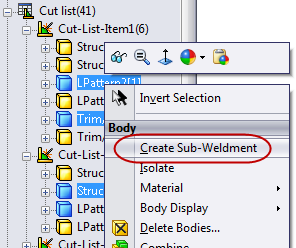 Something that has been confusing to students in my Weldments training classes is the proper way to create Sub-Weldments so that they retain all the work you have done creating properties for the cut-list items. 1. Create your weldment as normal. 2. Update the cut-list and add any additional properties to the folders. or from screen with bodies filter). 5. Then update the cut-list again (this is important). 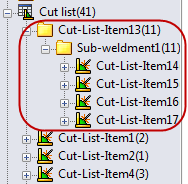 You will end up with three levels in the folder and the properties will be inherited into the Sub-Weldment. This will even take the properties with the sub-weldment if you save it out to a separate part file (using right+click, “Insert into New Part” on the sub-weldment). They will also be tied/related back to the original weldment file for updating! Of course, as an alternative to actual “sub-weldments” done this way you can always just make a weldment, make another weldment, and then stick them into an assembly together. The above method is nice because it keeps it all in one multi-body weldment part file rather than having to manage an assembly with multiple parts. Randy Simmons is an Application Engineer at 3DVision Technologies, a SolidWorks Value Added Reseller with locations across Ohio, Indiana, and Kentucky. He is a regular contributor to 3DVision Technologies’ Blog where you will find new ideas to improve your productivity with SolidWorks products. Want to try out the weldment capabilities in SolidWorks Premium? You can request a free trial on our website.